Normally at St. Jerome on Holy Saturday. 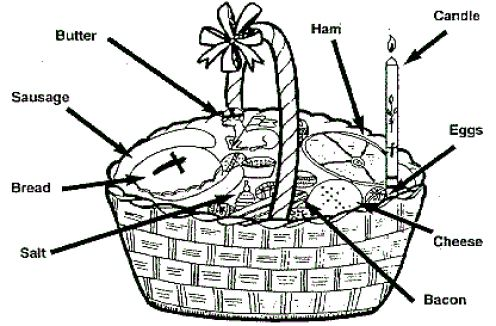 Maslo (Butter) - This dairy product is often shaped into a lamb (Baranek Wielkanocny) or a cross. This reminds us of the good will of Christ that we should have towards all things. Babka (Easter Bread) - A round or long loaf topped with a cross or a fish, symbolic of Jesus, who is the Bread of Life. Chrzan (Horseradish) - Symbolic of the Passion of Christ still in our minds. 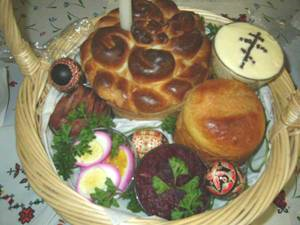 Jajka (Eggs) and Pisanki (decorated with symbols of Easter, of life, of prosperity) - Indicates new life and Christ's Resurrection from the tomb. Kielbasa (Sausage) - A sausage product, symbolic of God's favor and generosity. Szynka (Ham) - Symbolic of great joy and abundance. Some prefer lamb or veal. The lamb also reminds Christians that the Risen Christ is the "Lamb of God." Slonina (Smoked Bacon) - A symbol of the overabundance of God's mercy and generosity. Sol (Salt) - A necessary element in our physical life. Symbolic of prosperity and justice and to remind us that people are the flavor of the earth. Ser (Cheese) - Symbolic of the moderation Christians should have at all times. Colorful Ribbons and Sprigs of Greenery - are attached to the basket as signs of joy and new life in the season of spring and in celebration of the Resurrection. Linen Cover - drawn over the top of the basket which is ready for the priest's visit to the home or the trip to church where it is joined with the baskets of others to await the blessing. The food is then set aside and enjoyed on Easter Sunday. It is suggested that after the Easter Vigil Mass on Holy Saturday or Mass on Easter Sunday or any time during the Easter Season that a pilgrimage be made to the place where you were baptized. (If this is not possible then it is suggested that you visit the baptismal font in your parish church. The following prayers may be prayed when making the pilgrimage). Having renewed my (our) baptismal vows at Mass I (We) have made a pilgrimage to this baptismal font. Lord God, Here the door is reopened to the life of the spirit and the gateway to the Church is swung wide to those against whom the gate of paradise were shut....Over this font the lamp of faith spreads the holy light that banishes darkness from the mind and fills those who are reborn here with heavenly gifts. Those who profess their faith at this font are plunged beneath the waters and joined to Christ death, so that they may rise with him to newness of life....Grant, O Lord, that the people who are reborn from this font may fulfill in their actions what the pledge by their faith and show by their lives what they begin by the power of your grace. Amen. Let us praise the Lord and give Him thanks. Easter is the oldest and most significant festival of the Church year. It has been referred to as the keystone in the arch of Christianity because without it everything else falls. Easter season begins with prayers on the eve of Easter and ends fifty days later on the eve of Pentecost. Some meaningful symbols not depicted below are the lamb with a triumphal banner: the bursting pomegranate; the plant and stump (the resurrection theme of new life); and the Phoenix. Is a beautiful form coming from a seemingly lifeless chrysalis. This symbolizes Christ’s victory over death and the grave. It can also symbolize the believer’s victory in Christ. The larva is man’s condition on earth; the chrysalis is man in the grave; and the butterfly is man in Christ triumphant over death.